Automate the growth of your Leads. Our Constant Contact integration helps to automate the process of generating leads. It allows visitors and clients to sign up for your newsletter right in the pre-chat form. Thanks to it, you can send your campaigns to a wider audience. Constant Contact is an easy-to-use email marketing tool that helps to drive more customers to your door. With this solution, you won’t have to spend a lot of time or money to get big results. Every account comes with over 100 great-looking email templates that are responsive and can be easily customized to match your brand. What's more, the solution comes with list management tools, that help to grow your email list and let you easily integrate contacts from LiveChat and other platforms. It also provides real-time reporting, that will allow measuring your results in a snap. Best of all, you’ll never be alone. Expert coaches are always on hand with the product support and marketing advice. With all that, you will be able to establish better relationships with your customers, target your email campaigns, increase your brand awareness and close more sales. We know that gathering new subscribers is vital when it comes to marketing – that's why we wanted to make this process as easy as possible. With our dedicated integration and a step-by-step tutorial, we will make sure that you're only minutes away from gathering new subscribers! From now on your pre-chat survey will not only provide you with information about your customers but also add them to your newsletter list. Because keeping your customers informed is just as important as providing them with a quality Customer Service. A competitive advantage can be obtained by managing your products more efficiently and having good relationships with customers. With LiveChat, you can communicate with your customers using a channel they prefer while providing a superior customer experience. Add a new contact in Constant Contact when a LiveChat chat ends. It's a perfect way to gain new subscribers and extend your email campaigns reach. LiveChat isn't just for quick, one-on-one customer interactions — it's the place where long-term relationships begin. Using this integration you can send personalized campaigns after finishing a conversations with a clinet. 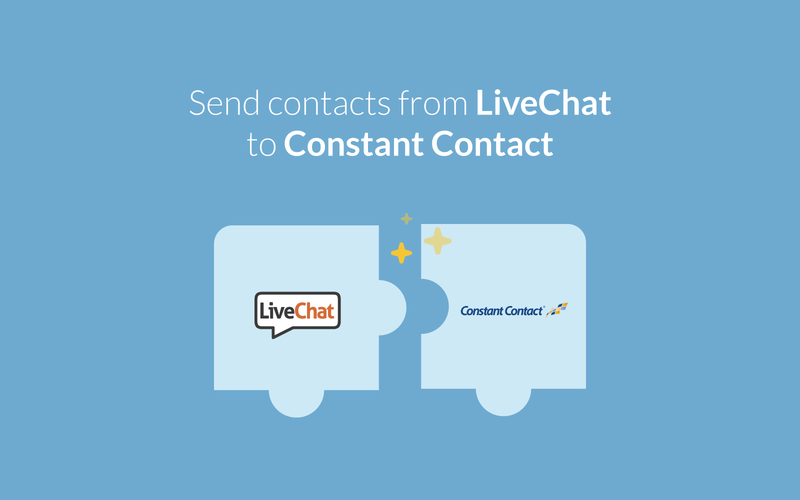 Start using LiveChat with Constant Contact now!